2200 Carmen: Isam B starring in a musical play! As a solo artist Isam B, his band and 5 dancers are going to be on stage at Norrebro Theater in Copenhagen with 8 brand new songs written exclusively for the musical play "2200 Carmen"
Check out N�rrebro Teater's facebook group or this thread on our forum for more informations about the musical. Few weeks after the concert Outlandish gave in Holland, NMO tv broadcasted a special program about the guys. In this 30 minutes program you can watch the trio arriving to Holland, hanging out with NMO's InFocus host Abdellah Dami and being interviewed by him. They told the fans in Den Haag that they're planning to release a new single February 2009 while their most expected and much awaited album will be out around May 2009. 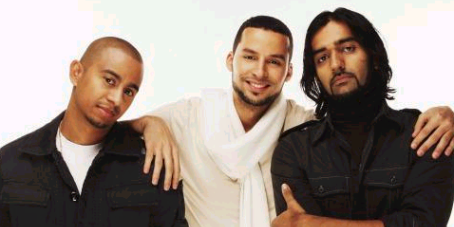 A special moment of the video is when Outlandish were talking about the situation in Gaza and how they were worried about their fan and friend Lina who lives there. The program's surprise was at the end of the video when Lina gave a phone call thanking OL and confirming she's doing well. Recently in relation with its continuing efforts to promote artistic development in Denmark and Danish art abroad, The Danish Arts Council has granted awards to a list of artists topped by Outlandish which was awarded the highest grant of 250.000 kroner. According to the council's chairman the aim of this last distribution is to provide substantial support for some releases, which can make a difference for the Danish music nationally and internationally. Last Friday, January 9th Outlandish performed live at the Dr Anton Philipszaal in a concert organized by Moon & Stars in Den Haag (The Hague). On the 25th of January the NMO (www.nmo.nl) , a national TV will broadcast a half hour program they made about the concert. It's been so long since I've posted any news here on the website, it's not only because of the lack of news about Outlandish but also because I was deeply concerned about what's going on in the middle-east lately, we should know that while we are living freely and securely in this world there's populations in places like Gaza (Palestine) under siege, facing massacres, war crimes and genocide by Israel's mass destruction weapons, so far more than 800 were killed and more than 3150 were injured, most of the victims are children. the UN was and still unable to stop the massacre!! Since Elmoro4Life.com is about music, I thought the best way to show our support is through music itself and I couldn't find a more powerful song than Michael Heart's "We Will Not Go Down"
Outlandish will be performing the International VAD Festival in Norway, a yearly festival where many talents from the Oslo music/dance scene are invited to perform. This is the 8th Vad Festival. Outlandmoro are the highlight of the day! This year's festival is arranged for charity and the main arranger of the evening is IHSG (Internasjonal Helse og Sosial Gruppe - International Health Care & Social group). IHSG has established a hospital specially for mothers and children in Pakistan, and 60% of the income will be given there as a support. The rest (40%) will be given to International AIDS Organizations..
Sony Ericsson and danish mobile telephone operator Sonofon are organizing a totally free concert November 27th in Copenhagen, Outlandish is the headlining band of the night, other notable performers include bands such as Suspekt and White Pony. Copenhagen Skatepark has limited capacity, the doors will be closed when the hall is full. 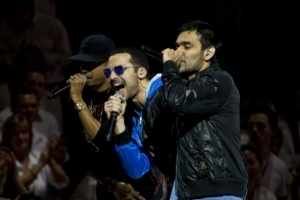 As part of a concert dedicated to celebrate “The White Album” by The Beatles, Outlandish performed live a cover Revolution #1 song. The Beatles is one of the most commercially successful and critically acclaimed bands in the history of popular music. Moros in Netherlands, be ready for the long-awaited Outlandish concert. On Friday January 9th, 2009 the guys are going to perform at the Dr Anton Philipszaal in the city of Den Haag (The Hague). The concert is organized by Moon & Stars, Moon & Stars engages in the production of music in collaboration with international artists with a non-Western cultural background. Outlandish was featured on Al Jazeera's brand new show PLAYLIST. See how three Danish artists are putting Copenhagen on the hip hop map. And, although Denmark is not known for its contribution to the hip hop scene, here is a band that is changing that. They are Outlandish: two Muslims and a Catholic whose backgrounds take in Asia and North Africa. Last Friday Isam Bachiri performed some of Outlandish' hits at The Eid Charity Extravaganza night in Manchester, Isam was the headline guest, other artists included The Sound of Reason and Dj Turkman Souljah. In this video you'll get a chance to hear Isam talking about his wife and his baby son!